Her Story Is supports artistic conversations, exchanges and creation among female artists in the United States and Iraq, culminating in performances and exhibits in Massachusetts and Iraq. Her Story Is founder Anne Loyer giving an update on events in Iraq. Her Story Is artist Lillie Paquette created this video about the project’s weeklong workshop in Dubai in 2017. Her Story Is focuses on empowering women’s voices. In fall 2017, four U.S. women artists and four Iraqi women artists began communicating via Skype, email, and blogging about their art, their lives, and the relation of their art and lives to their countries and the world. In December 2017, seven of these artists and three translators met in Dubai, a location accessible to all. Over five days, each participant offered a workshop and told her personal story. At this face-to-face encounter among women from two countries divided by war and geography, the participants laughed and cried a lot. All felt that the face-to-face meetings and the experience of discovering common and divergent experiences, was an invaluable step in building new relationships as individuals and artists between two countries separated by war and geography. After the artists and coordinators left Dubai, they reaffirmed their commitment to continuing the relationships and laying the groundwork for a series of collaborative projects in both countries. Since then, teams creating specific works have met regularly. As a full group, they continue to participate via emails, Facebook posts, Skype and What’s App calls, as they prepare for future public exhibits and performances. This project to support, strengthen, and expand relationships between women artists in Iraq and the Boston area continues work begun in the Basra-Boston Project, which offered a very successful exhibit and performances in 2016, as well as previous collaborations between Fort Point Theatre Channel and Iraqi artists. Since a series of successful presentations in Iraq and the Boston area in the first half of 2018, the Her Story Is artists have been hard at work, both on projects that grew out of the collaborative work and new initiatives. Jennifer Jean and Amir Al-Azraki are translating poems by Iraqi female artists. The poems will appear in an upcoming issue of Consequence Magazine, an international literary magazine focusing on the culture of war. Amy Merrill and Nadia Sakran, along with Dr. Suha Salim, a theatre artist and faculty member at Baghdad University, are creating a Her Story Is playwriting group made up of playwrights from Iraq and the United States. The goal is to use playwriting to tell the stories of women since the 2003 U.S. invasion of Iraq. All of the Her Story Is participants have been concerned about an ongoing crisis in Basra that began in summer 2018 with demonstrations for jobs and against government corruption. The crisis blew up into a regional health emergency involving tainted water. Thousands of local residents fell ill, suffering from dehydration, and worse. The U.S. press has offered little or no news about the crisis, but Elham Nasser al-Zabedy and Nadia Sakran have been kept the project informed through articles and Facebook posts. 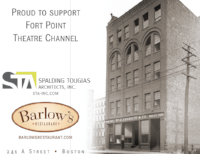 Her Story Is continues as series of ongoing collaborations of Fort Point Theatre Channel with a number of partners and sponsors in Iraq and the United States. Partners have included UMass Boston’s Joiner Institute for the Study of War and Social Consequences, the University of Basra, the Center for Arabic Culture, the Odysseus Project, playwright Amir Al-Azraki, and the Lotus Women’s Cultural League. 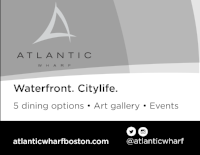 Project support has come from Boston Properties/Atlantic Wharf, the South Boston Community Development Foundation, the Massachusetts Cultural Council, and the Boston Cultural Council, among others.